The small circular Earth image is not the faraway Earth as claimed, but rather the surface of the Earth seen from low orbit, "cropped" by the round hatch window. The cloud pattern over the Earth's disc as seen on the screen remains constant during the broadcast, and is seen at a level of detail appropriate to a faraway Earth. In low Earth orbit the spacecraft would have to move very fast, more than 17,000 miles per hour, in order to stay in orbit. This is an inviolable requirement of orbital mechanics. At that speed the Earth's surface would be moving past the window quite noticeably. You could not hold the camera on such an image for more than a fraction of second without seeing motion. Mr. Sibrel claims that both the inner and outer round bezels of the hatch window, of different diameters, were used to create the rounded borders of the Earth image. Unfortunately only the inner hatch window bezel is round; the outer one is trapezoidal. It is unfortunate that Mr. Sibrel did not confirm this easily checked fact before making his claim. None of the other spacecraft windows is round. This fact is especially important when you view the entire downlink video, where the lights in the cabin are turned on to reveal that the earth photography wasn't shot through the hatch window! It was shot through one of the squarish side windows. Sibrel's understanding of the command-module layout is rudimentary. But not only does he fail to interpret the video correctly, he doesn't give the viewer enough information to confirm or dispute A Funny Thing's conclusion. Recently Sibrel has echoed the claim of David Percy and Mary Bennett. These authors say a printed transparency containing an image of Earth on a black opaque background was fastened over the window, the glow from the real Earth providing the backlighting. To support this, the authors show footage of the astronauts having fastened star charts over the windows as makeshift sun shades. This grasps at straws, but it does solve the problem of the moving clouds. The clouds in a transparency won't move. A piece of felt or cardboard was placed over the window to simulate Earth's terminator for some shots. Mr. Sibrel doesn't explain how he knows this was done; the narrator simply declares that it was. On the television screen we see the expected view of a partially shaded Earth -- exactly what we'd expect to see from a distant spacecraft. A Funny Thing just insists it must be a stagecraft trick and gives no further explanation. Ironically in his Astronauts Gone Wild debut in Nashville on March 11, 2004, Bart Sibrel remarked at how "well done" the "fake" terminator was; it looked just like the real terminator. That's because it was the real terminator -- he has shown no evidence otherwise. Clearly some kind of matte was used because when the camera is reset to cabin lighting conditions, the entire window is lit up showing a bright nearby object. That would have been impossible hundreds of thousands of miles from either Earth or Moon. The sunlit Earth is quite bright, even when seen from a distance. The camera aperture was at f/22 (i.e., appropriate for bright light) at the beginning of the clip in question, which is partly why the cabin appeared so dark initially. The cabin interior was not as bright as sunlight, so when the camera was readjusted for interior lighting and the aperture opened up, the sun blazed very brightly through the window. Contrary to naive expectation, windows looking out into a pitch blackness do not have to show up as pitch black in photography, or even to the naked eye. Later, after the astronauts believed they were not being recorded anymore, they took off the felt matte. There is no indication the astronauts ever believed they were not being recorded. In fact they continue for several minutes with the cabin lights on, showing pictures of the crew and other views of the spacecraft. The camera is now on the opposite side of the spacecraft. Struts, straps, cables, and astronaut limbs are scattered between the camera and the view of Earth out the window. Trying to argue that something is being removed from the window, Sibrel shows a brief few seconds of video where the view is partially obscured, and then cleared again. He has disingenuously chosen to begin his clip with the item already in the way (implying it had been there all the while previously), then end the clip shortly after the camera shifts to view around the obstacle. The cabin lights are still off so all that's seen is a silhouette of the obstacle. This few seconds is part of a larger context in which it's clear things are moving between the camera and the window. Mr. Sibrel chooses not to provide that context. Further, Sibrel has neglected to discuss the portion of the clip where the astronaut backs away from the window through which he has been shooting the Earth. 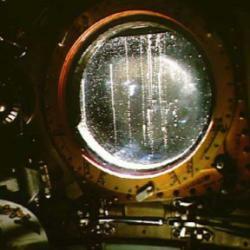 There is physical evidence of this maneuver in the form of a dimmed cabin light that swims into view, and documentary evidence in the form of the astronaut's narration wherein he distinctly describes backing away toward the rear of the capsule. In this portion of the downlink the Earth does not change size in the frame. This proves it was not merely framed by the window, or taped to the window; this can only occur when the subject is very far away, so that the relatively small retreat doesn't mean much over that distance. Conspiracists might be tempted to explain this away in the form of a "Spielberg Zoom" wherein the camera's zoom lens was manipulated as the astronaut retreated from the window, thus keeping the Earth's image the same size. Unfortunately this would also prevent the cabin light from entering the frame. 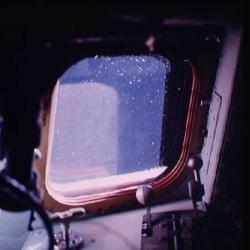 As the astronaut retreated from the window, he would have to narrow the camera's field of view (i.e., zoom in) in order to keep the Earth image (taped to the window, or outlined by it) the same size. The narrowed field of view would still exclude the cabin light. Only about twenty seconds of this footage was ever broadcast to the public. Here Mr. Sibrel makes his most colossal mistake. According to his theory, the footage NASA mistakenly sent him was the "raw" footage -- about an hour's worth -- made in low Earth orbit and transmitted back to Houston where the best bits of it would be edited together like a motion picture to form a convincing clip of life on the way to the moon. In his eagerness to reveal his "secret" footage, Sibrel neglected to verify just how much of it actually did make it to broadcast. Had he done so, he would have discovered that 30 minutes' worth -- fully half his "secret" footage -- is actually the live telecast that took place some 34 hours into the mission and was carried live for half an hour on television. This half-hour telecast includes many of the shots A Funny Thing claims are backstage trial-and-error that was supposedly never to be seen by anyone. Unbeknownst to Sibrel they were seen literally by millions. So much for being "behind the scenes." But how could Sibrel have made such a mistake? He was probably so mesmerized by the apparent secrecy of his discovery that he overextended his interpretation of the title frame (Fig. 3) to apply to the whole film, assuming on that basis that it was all secret. But in fact his film contained both private and public telecasts, and Mr. Sibrel never bothered to investigate that possibility. Unfortunately for him, this has led him to base a theory upon the premise that something was private which, in fact, was very public. Trying to put this all together into a coherent, believable scenario is quite difficult, which is evidently why Mr. Sibrel chose not to do it in his video. As with most conspiracist offerings, A Funny Thing is a hodge-podge of claims that have, in the end, very little to do with one another and very little to do with any one specific hypothesis. A Funny Thing's hypothesis is that the Apollo astronauts never left Earth orbit, and so they had to fake their telecasts from there. The lunar surface telecasts were pre-recorded; shot in a studio and then played over some sort of relay in order to make them appear to come from space. The film claims the downlink was undertaken to provide raw material that would be edited on the ground to form the "live" telecast. Some way of creating the distant Earth had to be contrived for this. Or did it? Any transparency would have to be created on the ground before the mission. Taping it to the spacecraft window was only to provide an appropriate light source. During this portion of the clip there's no other evidence that the footage is being shot on the spacecraft -- just the circular Earth image swimming in a sea of black with the astronaut voice-overs. 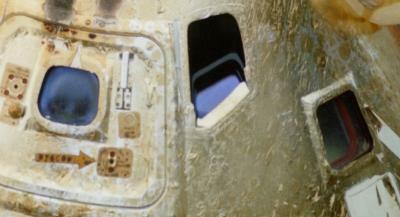 At no point did the telecast simultaneously show the recognizable cabin interior and the distant earth. Why couldn't this have been shot on Earth prior to the mission, as the lunar EVA allegedly was? NASA was apparently already committed to editing together various material for the "live" telecasts. Why did that particular segment have to come from raw material shot in space? Obviously pictures demonstrating zero gravity would best be shot in space. But why the fake distant earth? The film, of course, argues that the window bezels were used as a matte, but that is factually untenable. The revised hypothesis is little better. Would television footage of a supposedly distant Earth best be faked by a backlit plastic transparency? Of course not, but that's the hypothesis that fits the conspiracists' desired interpretation of the downlink, so that's the only hypothesis considered. How to obtain such an image? Artwork? A photo from a space probe? The latter sounds interesting. NASA had already sent unmanned spacecraft to the moon. It wouldn't have been that difficult to provide one with a television camera and have it transmit back pictures of earth from a great distance. But the problem here, and with artwork, is that you have to guess at the weather. Television footage taken some months prior to Apollo 11 won't show the correct weather for mid to late July 1969. Nor will artwork. Therefore the footage from the space probe would have to be live, or close to it. Either way, the problem remains that a static representation of Earth won't be right, nor does it have to be photographed from inside the spacecraft in order to create the illusion. NASA editors could simply assemble the onboard zero-gravity footage with the pre-recorded "distant Earth" footage into the seamless live telecast. And as a filmmaker, Sibrel should know that "opticals" are best done in post-production, not "in-camera" on location -- especially a difficult location. Space writer and former NASA engineer James Oberg points out an obvious problem in Sibrel's scenario: if the astronauts were indeed in low Earth orbit, they would have been in the necessary line-of-sight for ground stations for only 4-5 minutes at a time. It was impossible in the 1960s to transmit television from low Earth orbit for the 20-30 minutes he says the fakery lasted. On the other hand, if the spacecraft really was where the crew said it was -- 130,000 miles from Earth -- it would stay at the same point in the sky (relative to other celestial objects) for hours at a time. And rocketry bears on this as well. A Funny Thing stresses that U.S. space technology was simply not good enough to produce rockets reliable enough for a moon mission. Here Mr. Sibrel displays his layman's incorrect understanding of the dangers of space launches. The catastrophe montage earlier showed rockets blowing up within sight of their launch pads. And indeed that tends to be where rockets blow up. If that's true, then it doesn't matter whether a rocket was destined to go to the moon or simply to low Earth orbit. It has exactly the same chance of blowing up in the first five minutes, after which it's relatively free and clear. Dr. von Braun made this point explicit: if you decide to put a man on a Saturn V, it does not matter how far you send him. Mr. Sibrel presumes that sending three astronauts to low Earth orbit takes considerably less skill and considerably less luck than going to the moon, and is therefore the "safe" bet. It just doesn't work that way. The best refutation for Bart Sibrel's interpretation of the "secret" downlink video is the video itself. It is relatively easy to obtain. Mr. Sibrel shows you very little at all of the downlink, although he (wrongly) claims to be the exclusive source of it. At the end of A Funny Thing the astute viewer realizes he's seen almost none of the purported hour's worth of telltale videotape, but he's heard Sibrel's narrator talk at length about it. The viewer has no way of knowing whether the analysis is correct or defensible, or if the narration indeed has anything at all to do with the film. Claims made about evidence are considerably weaker than claims made by evidence. A Funny Thing's rhetorical theme describes stripping back layers of concealment, spin, and misinformation to reveal the truth. Yet when presenting what the film claims to be its unique and best evidence, A Funny Thing covers the telltale downlink with its own liberal coat of concealment, spin, and interpretation. Conspiracy theorists tend to be the most vigorous practitioners of the very practices against which they rail. By the end of a A Funny Thing the viewer has been given only an ad nauseam repetition of the filmmaker's unfounded assertions and his opinion about what the evidence means. The viewer has been given almost no means of coming to his own conclusions about what the downlink video is supposed to represent. After seeing the entire unedited footage it becomes clear that Sibrel's selective quotation from it is not a mere matter of necessary editorial redaction. Mr. Sibrel has chosen only that material that appears, at first glance, to support his interpretation of the whole. And he has shorn those clips from their context -- in many cases a clear context -- and omitted interesting and relevant material that disputes his claim.